We design, manufacture and install custom organizational systems that are as practical and efficient as they are elegant. Benefit from our experience and expertise. From Home Offices and Wall Beds, Sewing Rooms and Media Centers, Closets and Pantries, to Garages, we have been meeting the organizing needs of the SF Bay Area since 1973. Showrooms located in Campbell & Danville. At Organizeology, we love helping you organize your space so it works as hard as it can for you. Whether you’re a business looking to organize your offices or commercial space or a homeowner trying to make the most of every inch, or you’re in search of custom storage designs, you’ve come to the right place. Here, “usual” is anything but. Every project with us is custom, requiring a unique look at your needs and your space. We have clients who call on us for organizing once in a while, and others who schedule monthly tune-ups. If you have a tiny space or a grand area, we know how to organize accordingly. Whether you have an already organized space or utter chaos, we’re equally excited about both and ready to talk about how we can help. What’s more, we’re always up for an adventure. If you have something out-of-the-ordinary to propose, we’re all ears. Tara has a passion for organizing, she got her start by volunteering at her local elementary school and creating and organizing their art program. Her organization skills caught the eye of parents of the school. She started getting hired to organize garages, and rooms in their homes. Tara decided to create All Buttoned Up. Her work resonates with different parents and the San Jose community. Her favorite space to organize are crafting and art rooms. Home organization made easy! What is your headache? No time to organize the playroom, garage, collection? Whatever it may be, let's be honest home organization projects can be challenging; I’m here to lighten the load off your shoulders. I’m an honest and positive professional whose first priority is always the interests of my clients. I work with you to understand your unique needs and provide solutions that work for you. Since 2017, I’ve been serving loyal clients in the bay area - I LOVE what I do, so please get in touch to start enjoying my services today. Valet Custom Cabinets & Closets designs, manufactures and installs custom organizational solutions that enhance the functionality of your living space while complementing the décor of your home. Our talented design team creates unique solutions tailored to your specific needs, style and budget. We are independently owned (not a franchise or out-of-area conglomerate) and a direct manufacturer. This gives us the ability to be nimble, creative, and timely in meeting your goals and vision. Our areas of specialty include Home Offices, Wall Beds, Media Centers, Closets, Pantries, Garage Cabinetry, and much more. We create beautiful homes through decluttering, organizing, and styling. Our clients include those who are moving out of their homes and need help downsizing, sorting, and/or packing their belongings as well as those who are moving into new homes and need help organizing their new space. We also work with clients who are not moving and just need help decluttering, organizing, and styling their existing homes. 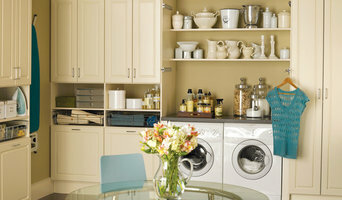 Organize Your Place provides professional organizing services throughout the San Francisco Bay Area. Karrah Smith, Owner of Organize Your Place, specializes in home and office organization. Whether you need help setting up a filing system or to simply organize your closet or kitchen pantry, Karrah has the right solution for you. At Bayfront Custom Cabinets and Closets, we design, build and install the highest quality custom cabinetry, closets, home offices, wall units, wall beds, garage cabinets and other homeorganization products throughout the house. We can match any finish to blend our cabinetry into your house decor. We are a local family owned and operated business servicing the San Francisco Bay Area. Our innovative design team members each have over 20 years of industry experience and provide all the solutions that you will need to transform your dreams and ideas into detailed reality. Our experience, quality, attention to details and dedicated customer service continue to reward us with repeat business and customer referrals. Our dedicated and skilled craftsmen will provide their expertise at every level and stage of your project. Our number one priority is to provide the highest level of customer satisfaction with our products and services. LMW Edits offers home and closet editing services, specializing in customized, tailored solutions implemented with style. Lucy works with busy, successful people and their families in San Francisco and within one hour travel time of the city. Her clients call her "a miracle worker" and "part of the family," and say that they trust her work implicitly. Closet Factory has been designing and installing complete home & office storage solutions for over 30 years. We are the "CUSTOM STORAGE SOLUTION AUTHORITY, and WE DESIGN AROUND YOU!" Closet Factory is also "The Professional's Choice"! When Builders, Interior Designers, Decorators, General Contractors, Real Estate Agents, Home Re-Modelers, and other professionals need storage design and installation throughout home or office projects, they call Closet Factory. Who you refer your customers and clients to can be a great success or a catastrophic error. Closet Factory Designers, Installers and our entire staff do the job right, and are always sensitive to the needs and requirements of property owners, as well as mindful and respectful of the work of other contractors working on site, by working as cleanly and quietly as possible, leaving the work site in "move-in" condition! For more than thirty years, California Closets has designed custom storage solutions for every room in the home. With businesses throughout the U.S., Canada, the Caribbean and Mexico, it is the largest custom storage company in the world, known for intuitive organization, innovative design, world-class materials and a commitment to creating an exemplary customer experience. California Closets provides consumers with more of life’s most valuable commodity – time. Since the beginning, our top priority has been to focus on our customers’ needs. We’re committed to listening to the needs of every customer, working with them hand in hand, and always recognizing that it’s a true privilege to be invited into their homes and their lives. We’ve helped transform spaces and allowed people to get more out of their homes—and do more in their everyday lives. And as we move forward, we will passionately continue to do this, and more. Before hiring a professional organizer, consider exactly what you need. Have you just moved into a Walnut Creek, CA home and have no idea where to put everything? You may want to consider an organizer who specializes in room-by-room space planning or estate organization. Perhaps you’re faced with a tiny closet and an overflowing wardrobe. In that case find a professional who focuses on closets to help you get back on track. Also consider the types of objects that need organization. Are they items like books, family photos, files or collections? You’ll want a professional organizer who has experience designing custom systems with Walnut Creek, CA companies that will best fit your needs. Find a professional closet and home organizer on Houzz. Narrow your search in the Professionals section on Houzz to Walnut Creek, CA closets and home organization.